natalie's sentiments: Who needs money??? I think that we should go back to the days when the economy was fueled by trade. It is a fantastic concept... Check out my latest Paisley Lane trades! Thank you, Thank you to Karen at PaperDoll Designs. She sent me these amazing personalized bottles. Lydia and I are going to be the most stylish girls at the gym! I love the black and turquoise on mine. It is SO me. 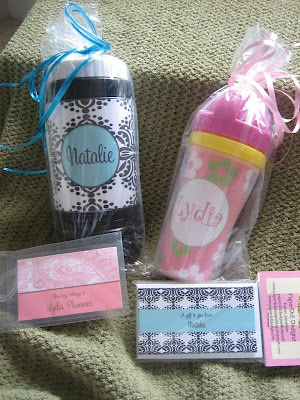 As a extra treat she sent a package of personalized gift cards and a bag tag for Lydia. Perfect, since A. - I am supposed to keep her bag labeled at the gym and I always forget. And B. - I am admittedly obsessed with stationary. Karen, how do you come up with all these great ideas?! 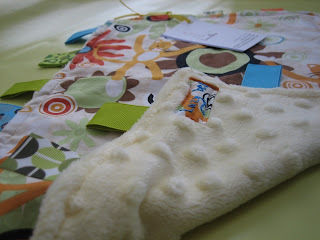 Then to top things off, my friend Elizabeth traded me one of her famous "snugglies" from her company Lazy Bee. Check out her new site. She finally is selling the hand knit toys that are the highlight of baby showers over here in TN/GA. Thank you ladies. Made my week. Hello awesomeness! I've so got to get in on this trading action with my bags!! I have no idea how I found you, but am I glad I did! 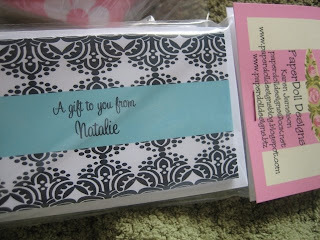 Your blog is so fun to read, and I, too, have a passion for stationary! It's so cute! I'll be back! 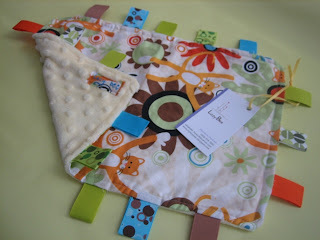 ♡ I love those taggie blankets or whatever they're called! They're so cute! My kids loved those! Those are some awesome trades there. you are making trades place. good for you!